How was your weekend? Get a lot of Christmas shopping done? Clean your house? Spend some quality time with the kids? I spent my weekend working, trying to get a jump on a book I’m writing for two doctors. In fact, that’s one thing I always tell “newbies” (people who are thinking about or who have just decided to go into freelance medical writing who ask me for my trade secrets). Looking for a 9 to 5 work schedule? Fuggedaboudit! When you’re a freelancer you are also a business owner. And your business doesn’t stop at 5 p.m., especially in these days of 24/7 access. That means being available to your clients, current and potential, around the clock at least to the point of responding to emails in a timely manner, even emails that come in on a Saturday. I’ve been freelancing for 10 years now and I can count on two hands the number of full weekends I’ve taken off (defined as not sitting in front of my computer for anything other than e-mail checks). I work during vacations, I work while traveling, I work at night. This might sound like I’m working 60 or 70 hours a week. But no, when I run reports from my time-tracking software the results always average out over a year to about 30 hours a week. Why then, you might be asking, do I work beyond “normal” work hours? First, consider those 30 hours. They are not spent eating lunch, talking at the water cooler (i.e., email listserves, Facebook, Twitter), going to the bathroom, playing spider solitaire (a major weakness) or kibitzing online. When I do any of those things, I punch out, something people in an office don’t do. 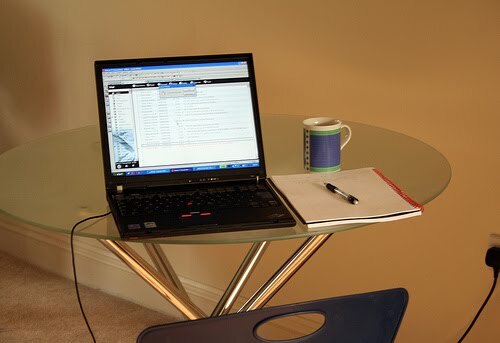 Second, one of the advantages of freelancing is setting your own schedule. So while I’m typically at my desk by 7:30 a.m., I also take a break in the late morning to work out at the gym and I take a nap–yes, you hear right, a nap— nearly every day around 1 or 2 (to all clients who have tried to schedule meetings with me during the early afternoon, now you understand! 🙂 I promise more on the restorative nature of naps in a future post. I often have to drive a kid to soccer or piano in the late afternoon, hit the store for dinner, or, and this pains me to admit it, head to my massage therapy for my biweekly deep tissue therapy on the mouse arm/shoulder/back (a hazard of long-term freelancing). So I don’t mind the evenings I head back to the office after dinner to draft an article or research a project. Or the Saturday or Sundays I spend uninterrupted hours digging deep into some complicated assignment. It always amazes me how much “quieter” the office seems on weekend without a constant flow of emails and how much more efficient I am! I’m often asked how I separate home life from work life given that I work at home. My answer is always the same: I don’t. Personally, I like the merging of boundaries. I like that my kids (when they were younger) came into my office to do homework. That they always know where to find me. That if there is a snow day or a sick day or an after-school event that they need a ride home from I can manage it. I particularly like it now that I have two teenagers at home (17- and 13-year-old boys) and know that they never come home to an empty house (my mother worked out of the house and I know what I did in those dangerous after-school hours). Want to have a bunch of friends over on a school holiday? No problem. I’m always here. My kids (including the 22-year-old) have grown up watching me work, understanding the value of hard work, and seeing what it takes–literally–to be successful. So yes, I worked this weekend. And, to be honest, I wouldn’t have traded it for the world. So, what are your thoughts of weekend work and work/life boundaries? When I was on a pc I used this fantastic time tracking software called TimeTrax; now that I'm on a mac, I use Time Tracker 2, which isn't nearly as good. I need to find something better. Semi-related… but how do you track your time? Specific time tracking software? Stopwatch and paper/spreadsheet? Some other method? Wanda, you're making me blush. Thank you so much! I LOVE this article….despite being a medical writer myself for the last 10 years, still found it an immensely enlightening, and enjoyable read. I take Sundays off, because I agree with Alisa – I need a complete mental break one day a week. I'm at my sharpest on Mondays. Otherwise, I don't mind blurred boundaries. Back when I was an academic, I worked all the time because my work was my calling. As a writer and business owner, I have the same sense of calling. If you have a vocation, schlepping it around with you or chipping away on evenings and weekends isn't a problem. I don't work weekends now as much as I used to, mostly because I've found that I need a complete mental break in order to recharge (at least a day… or a part of a day…) I have found that I just need to write when my brain is ready to write, and that might not always happen between 9 and 5.